One of the best ways to get around the island is by the 'reggae' bus. Getting to Barbados is easy with direct international flights from London and Manchester in the UK and regular services from the USA and Canada. 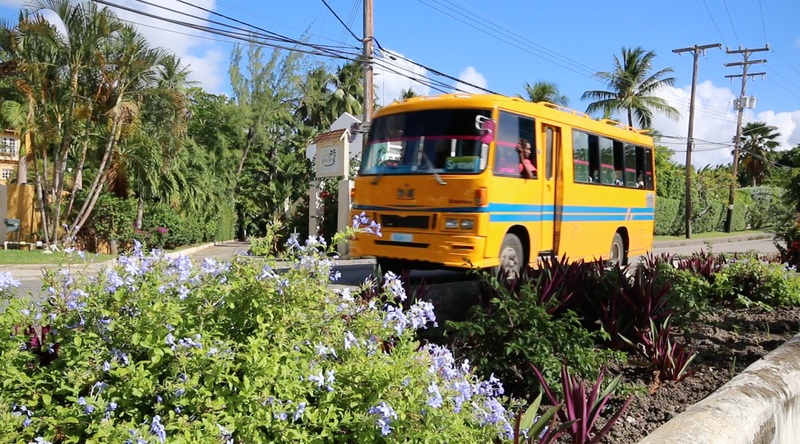 The quality of the luxury villas and apartments available to rent in Barbados is such that you won't want to leave your home-from-home but once on island, why not hire a car or hop on a yellow reggae bus to get the most from your visit. When we get the chance, we love to take little excursions - perhaps a catamaran cruise to swim with the turtles or a trip over to the east coast to enjoy the cooling breezes and the more rugged landscape. But we recently took an altogether more exciting excursion as we enjoyed a three night visit to the island of Canouan in The Grenadines. Canouan lies around 110 miles west of Barbados and is a verdant, hilly island of just 5 square miles (Barbados is far larger at 166 square miles) and we stayed at a luxurious villa named Canoten which is owned by one of our main partners in Barbados. It is a wonderful 4-bedroom property with extensive coastal views and lovely pool and sun deck. Renting a villa in Barbados is one of the most popular ways of staying on the island but the choice of Barbados villa rentals is so extensive that it can become a little bewildering. We hope that our selection of Barbados villas and apartments will be a good starting point – all have been visited by us and have been selected for inclusion in our programme – but we have also put together a few pointers which we hope will help you get your ideas together before you book your next stay in Barbados. After 11 months of work and an estimated spend of BDS$ 45 million, the new Massy supermarket has just opened in Holetown on the site of the old Sunset Crest store. We are in Barbados at the moment and (along with hundreds of others) were soon through the doors on the first day, curious to take a look inside and see where we would be doing most of our food shopping on island over the next few years. We are pleased to have been involved with the organisation of a number of weddings on the island and we would be happy to advise on the most suitable venue for your own event. We can also put you in touch with our partner for wedding planning on the island Malissa Blackman who runs Weddings by Malissa and is one of the best known and most trusted wedding planners in Barbados. After landing at Grantley Adams airport we were welcomed by a delightful lady called Autumn who was waiting for us just before the Immigration Hall. She scooped us up and whisked us along a Fast Track lane to an empty desk, completely by-passing the lengthy queue and even arranging for a baggage porter while we had our passports stamped. If you’re looking to take a little Bajan sunshine home with you, look no further than the Best of Barbados gift shops. These busy boutiques can be found in five locations around the island and are definitely one of the best places to visit for souvenirs. Mention the words “retail therapy” or “designer brands” or combine these words into a sentence whilst on holiday in Barbados and my husband, Mark will run for the hills, a beach or possibly a rum shack. But I see things a little differently and when the Limegrove Lifestyle Centre appeared, it seemed almost overnight, in Holetown I had to go and investigate – many times.